Otis Pratt Pearsall Pearsall recounts how he and his neighbors pushed for legal protection for the architecture of Brooklyn Heights, which eventually became the first historic district in New York City. Years before the Landmarks Law was drafted, attorney and Brooklyn Heights resident Otis Pratt Pearsall not only spearheaded his neighborhood’s effort to achieve historic district designation, but also meticulously documented this effort. This transcript of a “Sages and Stages” forum sponsored by the New York Preservation Archive Project in 2004 features Pearsall in conversation with Andrew Berman, executive director of the Greenwich Village Society for Historic Preservation. During the forum, Pearsall recounts how, beginning in 1958, he and his neighbors became aware of the Bard Act, recruited Clay Lancaster to document the historic character of Brooklyn Heights, proposed historic preservation legislation, and connected with preservationists and officials beyond the Heights as the citywide push for preservation gained momentum. Pearsall addresses important debates and decisions, such as the evolution of district boundaries and negotiations with the Watch Tower Society over new construction. He also discusses the cooperation between the Brooklyn Heights organizers, the New York City Planning Commission and the New York City Landmarks Preservation Commission as the Landmarks Law was developed and implemented. Later in the discussion, Pearsall and Berman discuss the steadily broadening appeal of historic district designation as a policy mechanism to stabilize and preserve neighborhoods. Q3: On behalf of the [New York Preservation Archive] Project, and the New York Preservation Center, I want to welcome you to the first in our series, called “Preservation: Sages and Stages.” I also want to thank our funders, the New York State Council on the Arts and the Samuel H. Kress Foundation. You’ve probably all heard the saying, “The cobbler’s children have no shoes.” So far, that’s the best explanation I’ve found for the irony that the historic preservation movement has devoted so little energy to preserving its own history. We are so passionate and engaged in saving the history of society, of movements, of neighborhoods, that we ignore our own. Even when a preservation battle is successful, how often does the public interpretation of a site’s history include the story of how it was saved? The impression left with the public is that our history is naturally and effortlessly preserved, instead of the true story: that most of our history is saved only because of the concerted efforts made by concerned individuals. Not only does the preservation movement ignore its own history, it often seems to ignore the reality that it has a history. Many preservationists function as though they’re involved in a cause with no past. As though they were uniquely immune to the passage of time, and the type of change that impacts everyone else. Sometimes it appears we must not only reinvent the wheel, but we have no sense that we might even be able to improve upon the wheel. Whatever the reason for this state of affairs, the result is that preservation has failed to capture significant, written records of its past, and also the wisdom of many of its leaders. Guided by a belief that preservation’s own history can be as instructive and empowering as the history preservation seeks to preserve, the New York Preservation Archive Project [NYPAP] was established to document, preserve and celebrate our history as preservationists. Today’s event is focused on both documenting, preserving, and celebrating that history. Preservation’s history as a resource is yet to be mined for its content. The sages of our movement—the people who’ve devoted decades of their lives to preservation efforts—represent valuable intellectual capital. In this series, we hope to capture that asset, and share it with the sages of tomorrow. You in the audience, and those of you who have access to these programs through our website and our archive. As with death and taxes, in the world of preservation there seem to be issues that will always be with us. The battle over historic districts, as though each proposed new district was the first ever discussed. Preservation advocacy—when to use honey, and when to use battery acid, and the appropriate measure of each. Preservation planning—an oxymoron, or a reality? Preservation and politics—what’s the best way to get them to do what we want? Each generation of preservationists seems destined to grapple with these and other concerns. It’s our belief that those who are emerging as preservation leaders today will better respond to such challenges if they have access to the thinking and experiences of those who have dealt with them in the past. In no way are we suggesting that the answers of the past will necessarily do for the future. Rather, we do suggest that the experiences of the past, both the failures and the successes, can help lead to better answers in the future. Appreciating that preservation has a history and understanding more about that history is critical to the future success of the preservation movement. Just as one would not advocate practicing 1960s medicine today, one would not advocate practicing 1960s preservation in 2004. Rather, whether it be modern medicine or modern preservation, current strategy, practice and philosophy, is best built on a firm understanding of what has come before. Over the last fifty years, preservation has accomplished a lot and learned a lot. Preservation does have a history and we ignore it at our own peril. This series is an attempt to capture some of the wisdom of the past, and share it with those who will be making preservation’s history in the next fifty years. This is really also an experiment in programming. It’s kind of a mix of oral history, of the Charlie Rose show, and, perhaps, maybe we’ll get in touch with the presidential debates. The concept is to have a sage—a preservation leader, someone who’s made a major contribution over the decades, explore a series of kind of timeless questions, if you will, led in that discussion by an emerging leader, focusing on the same topic. Someone who, today, is dealing with the same issues that the sage has dealt with off and on over the decades. To moderate the conversation, we have a host who will kind of set the stage for the conversation, moderate it, move it along, and then ultimately open it up to questions and conversation from the audience. So that’s what we’re really all about today, and at this point I’m going to turn the podium—turn the program, the podium is staying here—over to Laura Hansen, who is the host of today’s program, who will introduce the speakers, and set the stage for the session. Thanks to all of you for coming [applause]. Q2: I’m going to start by saying some thanks to people who have organized this series, who I think are all in the room. Vicki Weiner, who’s a board member of the New York Preservation Archive Project, Rudie Hurwitz and Liz McEnaney, staff members of the New York Preservation Archive Project, Felicia Mayro, director of the [Neighborhood] Preservation Center. And since we’re all about archiving, Richard George is videotaping the program today, so thanks. Thanks for coming. I’m going to tell you a little bit about who we’re talking to today. I’m very pleased to introduce the first of the Sages and Stages team, two of the more politically savvy advocates working in the preservation field today. We can have an interesting conversation, I know, and we want to involve you. We’re going to do about forty-five minutes of an interview between Andrew Berman and Otis [Pratt] Pearsall, then we’re going to have about twenty minutes for questions. But I’d like to start, since we’re an intimate group—I wonder if I can have two volunteers, to just tell me why you came today and what you’re hoping to get out of this. I’m assuming that we’re all involved in preservation in one way or another, and since we’re going to be here to learn, I’m just wondering if anybody can tell me what they were expecting. Anybody? It’s okay if you don’t want to do that. Marcy? Marcy Reaven: I was really thrilled that this was being organized, because I don’t come from a preservation background, and I find myself working in that arena a lot and not knowing what happened before, actually. Not having any idea whether I’m repeating ideas that have been repeated a million times, whether they’re new ideas, or where can I go for more information and reference. Audience Member: We’re students at Pratt [Institute] and this is our first semester, so it’s just kind of exciting for us to be able to come and be involved in something like this for the first time. Q2: Great. Good. You really are the new generation. Well, Otis and Andrew are paired to help us bring some cross-generational insight into a very specific topic in preservation. That is how historic districts are designated, regulated, and enforced. So I’m going to read a little bit about each of them. Otis Pearsall, on my left—in a 1998 New York Times article, Otis summarized the objectives of the Brooklyn Heights Association: “We want it to be proactive rather than reactive.” Mr. Pearsall has been a proactive preservationist in New York City for over forty years. His contribution to the preservation movement has afforded us the opportunity to, today, stroll through the character-laden streets of Brooklyn Heights. Otis spearheaded the nearly seven-year campaign that led to the designation of Brooklyn Heights, on November 23, 1965, as the city’s first historic district. His efforts began in the fall of 1958. He, along with a group of professionals, formed the Community Conservation Improvement Council—the CCIC—to challenge Robert Moses’ proposed Cadman Plaza project, a project that threatened to destroy a number of period houses and replace them with high-rise, luxury-priced rental efficiencies. CCIC, which was later absorbed by the Brooklyn Heights Association, fought to preserve the neighborhood through aesthetic or historic zoning. The group was guided, in part, by National Trust [for Historic Preservation] publications, including “Preservation of Historic Districts by Architectural Controls.” It was aware of the Beacon Hill historic district [Historic Beacon Hill District] in Boston, established by the Massachusetts legislature in 1957. The most important document to the CCIC, however, was the Bard Law of 1956 [the Bard Act], authorizing cities in New York State to adopt regulations to protect places, buildings, structures, works of art, and other objects having a special character, a special historic, aesthetic interest or value. Within months of establishment, the CCIC announced, in the February 26, 1959 issue of the Brooklyn Heights Press, its proposal for a historic preservation ordinance under the Bard Law. The council enlisted the support of notable city groups such as the Municipal Arts Society [MAS]. They also encouraged Clay Lancaster, an architectural historian, to conduct a survey of houses in Brooklyn Heights. The survey led to the publication of Mr. Lancaster’s book, New York’s First Suburb: Old Brooklyn Heights, which was used as propaganda to convince the city to pass a zoning amendment necessary to protect the character of the neighborhood. Felicia, do you have a copy of that book? Q2: Okay. If you want to take a look. A lawyer by trade, Mr. Pearsall later worked closely with the Municipal Art Society, submitting an amicus brief defending the Landmarks Preservation Commission [LPC] in the Sailors’ Snug Harbor Case in the 1960s [Sailors’ Snug Harbor v. Platt]. In 1992, he was elected to the board of Greenwood Cemetery. He’s a member of the New York City Art Commission, representing the Brooklyn Museum of Art as well as the Brooklyn Heights Association. He serves on the board of the New York Preservation Archive Project. He and his wife, Nancy, were presented with the Lucy G. Moses Preservation Award in 1999, recognizing their preservation leadership. Andrew Berman is the executive director of the Greenwich Village Society for Historic Preservation, through which he has fought to see the character of the [Greenwich] Village [Historic District] maintained through appropriate zoning and designation of historic districts. Under his leadership, the GVSHP spearheaded the successful efforts to secure the designation of the Gansevoort Market Historic District, which protects one hundred and two buildings on parts of eleven blocks in the Village. To Mr. Berman, the designation of the Gansevoort Market Historic District did not signify the end of the battle. He is now working to ensure that the provisions of the historic designation district are enforced and similar protections are extended elsewhere. Today Mr. Berman and his colleagues at the Greenwich Village Society are pursuing the designation of a historic district that would protect the far West Village and the Greenwich Village waterfront. They are also exploring the possibility of a South Village historic district, to protect the working-class immigrant history of that area. In addition to protecting areas in the Village, Mr. Berman is organizing a campaign to extend landmark designations to federal rowhouses in Lower Manhattan, and is leading a citywide coalition of community groups seeking to reform the city’s regulations regarding the development of community facilities. So, what’s changed since 1965, when the Brooklyn Heights Historic District became the city’s first? What hasn’t changed? I think we’ll find the answer to both questions is everything and nothing. Therefore, Otis’s experience and hindsight, coupled with Andrew’s insight into the practical implications of that history for his advocacy, will provide inspiration for all of our own work. At least that’s our goal. When Otis and his wife, Nancy, who’s very involved in this whole effort, right? Q2:—and their neighbors, began their campaign in the late 1950s, there was no [New York City] Landmarks [Preservation] Law. There was only a nascent movement in that direction. They were selling something totally new, and as Otis has been quoted saying, “We were the only ones beating that drum.” They organized locally, bringing property owners, residents, and targeted groups, like realtors, together for meeting after meeting, over a course of seven years—which may sound familiar to some of you. They also played insider baseball with those in power, soliciting the mayor, his deputies, and influential groups like the MAS. They were up against powerful real estate interests, development pressures, and various political agendas. Andrew’s experience at the Gansevoort Market Historic District shares some of those same groundbreaking aspects. While that coalition was working within the Landmarks Law, being some forty years old, it was also selling something new. A much broader approach to preservation, linking that to other urban issues like zoning, other land-use issues, and economic development. That coalition was—and is—up against powerful real estate interests, development pressures, and various political agenda. So we have a lot of interesting parallels between both Andrew’s and Otis’s work. I’m going to just let you dive in. Q1: Well, thank you. Actually, first of all, I just want to start off by saying what an honor it is to be able to do this. My own familiarity and introduction to the concept of historic preservation in New York really was linked to the story of Brooklyn Heights. Knowing how that was sort of the first historic district, the first neighborhood to accomplish that. I’m very appreciative of the opportunity to have this conversation. Let me start with something that’s almost impossible for me to really conceptualize how this would have worked—but your effort began before there was even a Landmarks Law in New York City. Can you tell me a little bit about what the thinking was, in terms of how you were trying to accomplish something that there wasn’t even necessarily a structure in which to say, this is how it could be done. Pearsall: I guess necessity is the mother of invention here. We were confronted by several threats. [Robert] Moses was proposing to tear down—and his successors ultimately succeeded in tearing down—the northeastern corner of Brooklyn Heights. As we were contemplating what to do about that, our concern extended to the rest of Brooklyn Heights and what its future was going to be. Given the fact that we had progressed sufficiently by 1958, 1959, in terms of economic revival, the developers were beginning to target us. Most importantly, we had an institutional presence in our midst—the Watchtower Society—that was in the process of demolishing houses. Within a year or so, before we pulled ourselves together and started going, about eight houses in the Willow Street area had been torn down. So we didn’t think about, really, how difficult it was going to be. If we’d ever thought about how difficult it was going to be, we obviously would never have bothered to do it, because it was hopeless. We just got started, and we just put one foot in front of the other. We, first of all, tried to figure out whether there was any kind of a legal structure we could hook into. We discovered, to our delight, that the Bard Law had been passed about two years before. We had no idea about the Bard Law. We learned about that. We discovered, through a series of publications—Huson Jackson did a booklet in 1952, in connection with the AIA [American Institute of Architects] convention that was going to take place here in New York on historic buildings of New York. One of those came to hand, I can’t remember any longer how it was. I brought one along in my bag, in case anybody’s interested in real artifacts. More than half of the buildings in Brooklyn, listed in the 1952 guide, were in Brooklyn Heights. The Municipal Art Society, through its Committee on Historic Architecture, had put together in 1957 a similar list, really. Again, Brooklyn Heights was heavily represented in the list of Brooklyn structures. Q1: Was this how you first heard about the Bard Law? Or how, exactly, did that happen? Pearsall: I think it is. That’s exactly how we first heard about the Bard Law. It was quoted. It quoted the Bard Law. Later, we got a copy from the National Trust. They had a little package of things that they were willing to send out to neophytes such as ourselves. Yes, that’s exactly right. This wonderful booklet suggested that, in New York City, Brooklyn Heights and Greenwich Village represented the exact kind of circumstance that the Bard Law was designed to deal with. So knowing nothing, and not knowing the obstacles ahead, we were very encouraged. We thought we were practically there. This was at the end of 1958. Q1: You know, I just have to comment—you mentioned both Moses and the Watchtower. I guess that was sort of Brooklyn Heights/NYU [New York University], which, of course, both in the past and in the present, has been such a catalyst for preservation battles here. Of course, the Village had its own run-ins with Robert Moses, which was a real factor, both in terms of organizing people and sort of serving as kind of a rallying cry. You mentioned the Trust. Who did you turn to in those days, as a resource or support for what you were looking to do—for guidance, for assistance? Who was there? Pearsall: Well, I would say that the principal guy who was there was Henry Hope Reed [Jr.]. Again, some of these things get lost in the mists of time. I can’t remember how I first heard about Henry Hope Reed, but he came into my life very quickly. Certainly, before the end of 1958 we were talking to Henry Hope Reed, and he recommended two important things. One was getting the Municipal Art Society behind us, and he recommended Clay Lancaster as the right guy to go to, as an architectural historian, really, to do all the hard work. He lived right in Brooklyn Heights. Of course, we had no idea who Clay Lancaster was at that point. So Henry Hope Reed was an initial resource, and he led to other people. He led to Alan Burnham, he led to a variety of people. The National Trust was helpful. They had a little package. There were about fifty historic districts around the country at that point. Now, I understand, there are over two thousand. Mr. Chainani [ph] told me that there are over two thousand. Pearsall: Okay. Well, that’s an astounding statistic. At that time there were only about fifty, and the National Trust was very good about nurturing anybody who was prepared to take this on. They had a little package, and it included the Bard Law. It included a few other things, as well. Another person who was helpful was John Codman. John Codman was the guy who put together the Beacon Hill Historic District. He was the then-chairman of the commission up there. He’d written a how-to booklet on how to go about doing a historic district. We got his booklet, and in no time we were off and running with all this good stuff. Q1: Beacon Hill, in Boston, is one of the earliest, prominent successes. Probably something that Brooklyn Heights looked to, both in terms of what they got and in terms of the type of neighborhood as sort of a comparable situation, I would imagine. Pearsall: That was our model. That was basically what we were going to try to pattern ourselves after, because when we started—from the very beginning, we had in mind a stand-alone Brooklyn Heights historic district with its own commission, etcetera. Just the way Beacon Hill did at that time. In due course, wiser people we had in Brooklyn Heights—Arden Rathkopf, who was the author of a leading zoning treatise [The Law of Zoning and Planning]—he persuaded us that, at least initially, we should try for a citywide ordinance. He thought that that was the only thing that would actually float. We proposed that to James Felt, who was the chairman of the [New York] City Planning Commission at the time, at the spring, 1959 hearings on the proposed, new, citywide zoning ordinance. That fell flat. Q1: This, I imagine, was the precursor to what became the ’61 zoning changes? Pearsall: That was. Those were the initial hearings on those zoning changes, and we proposed to start our zoning to Felt, on a citywide basis—for very good reasons. He didn’t pay any attention to—actually, Geoffrey Platt became the first chairman of the commission [Landmarks Preservation Commission], unbeknownst to us, and was also pushing for a citywide historic preservation statute in the same context. He had, independently, the same idea that this provide a vehicle, whereby we could get historic—slip it into the zoning ordinance. Q1: Let me also ask—you made a brief allusion to this—what role did politicians and elected officials, particularly local ones, play in this? How involved were they? How much work did you have to do to get them involved? Q1: Maybe that’s the key. Pearsall: They were professionals who had just moved into Brooklyn Heights. There was a whole phenomenon that nobody’s ever really been able to explain. This was really the first time that a downtown city area, that was on its way downhill, turned around on its own and began coming back up again. That happened in ’55 and ’56, when that turnaround began. It began as a result of all these young lawyers, young bankers and young architects, moving into Brooklyn Heights. They had no political connections at all. The original group that did this was this CCIC organization, not the Brooklyn Heights Association. Later CCIC folded into the Brooklyn Heights Association. But these folks didn’t think along the lines of politics. You know, all the way through to 1965, we never became involved with a single, local politician. I couldn’t even tell you today who our councilman back then was. The only politician that—because, at that time, the city had set up this committee, and the committee became a commission. It was pretty clear that we were going to have to deal with those folks, and the citywide people like James Felt. The only politician who got deeply involved in this was Hugh Carey. Hugh Carey was a congressman from Park Slope, somewhere out there. He was a great friend of Bill Fisher, who was my colleague in doing all of this. Bill, I think, was president of the Long Island Historical Society, even at that point or shortly afterwards. But he was a friend of Hugh Carey’s. He got Hugh Carey interested, and Hugh Carey got the [U.S] Department of the Interior, before we became a historic district in New York City. In January of ’65 we became a national historic district, and that was Hugh Carey. But that’s the closest we ever came to being political. Obviously, we worked on the [New York City] Council in a very amateurish way when the time came to consider the Landmarks [Preservation] Law. But all of our dealings really were with Felt and his people, on a citywide basis. It’s interesting. They must have known what we were doing during that time. We were getting all this publicity, but they never came to us, and we never went to them. Very different from what happens today. It’s a totally different deal. Pearsall: Absolutely right. Good point. Q2: Did you need the Board of Estimate at any time? Pearsall: We didn’t need the Board of Estimate during the whole landmarking process. Right after that, faced with the challenge of a proposed destruction of a whole lot of additional houses and a tall building by the Watchtower Society—hey thought they were going to be able to take down some buildings. It wasn’t clear to us that the law was going to limit the ability to build a tall building. There are a lot of provisions in the Landmarks Law which explicitly say that the Landmarks Commission can’t consider the issue of height. As time has gone on, height has been rolled in under the appropriateness standard. That really is not a big issue anymore, but it was at the beginning. We went about trying to persuade the City Planning Commission to create something highly new, which was a limited-height district. Ultimately, the zoning ordinance was amended to provide for a limited-height district within historic districts. Q1: Tell me a little bit about that, because that is, in some ways, very unique to Brooklyn Heights, and has presaged a lot of what is going on now, which is not limiting these efforts simply to landmarking, but also bringing in zoning and seeing the interaction between the two. How did that work for you, and what was the success of that? Pearsall: Well, I think it was a great success, but I’m not sure I can really prove that. We succeeded in getting the City Planning Commission to agree to a limited-height district amendment to the zoning ordinance, and they enacted it. Pearsall: This was in 1968. Q1: After the landmark district was made. Pearsall: Yes. Maybe it was ’67. I think it might have been ’67. But by the time the whole process—we were in ’68. Then it had to be approved by the Board of Estimate, the zoning of amendment. That we had to have—Abe Stark came to our rescue there. This was back when you had to persuade your borough president that this was a good idea, whatever the idea was. Then through some kind of fraternal arrangement with the other borough presidents, you could prevail. Pearsall: Well, yes. The Board of Estimate was made up of the borough presidents, the City Council president, I guess the mayor, maybe. I can’t remember just exactly what the makeup was. But we succeeded in getting that zoning amendment approved by the Board of Estimate twelve to ten. We had all the borough presidents, and I think we might have had the controller. We lost the other people, whoever they were. It was a balance. Communities—neighborhoods — had a real ability to contend with citywide politics under the Board of Estimate, if you could persuade your borough president. Because he would then get the other borough presidents—they deferred. Borough presidents all deferred to each other on projects within a particular borough. If the borough president said, “Okay, I’m against this,” whatever it was that the city was doing, then the borough presidents would support that borough president. That’s what happened on this, and then we were designated. The zoning amendment allows—this is still true today—the zoning ordinance permits the establishment of limited-height districts — fifty-foot, seventy-five-foot, or hundred-foot—limited-height districts within previously designated historic districts. Most of Brooklyn Heights was then promptly designated by the City Planning Commission, approved by the Board of Estimate, as a limited-height district. So we have a fifty-foot limited-height district. I think Cobble Hill does, I think Gramercy Park does. At some point, the City Planning Commission just started declining to—but I’m sure other historic districts have really clamored to be designated, so I don’t really know what happened to that. Except that we are a limited-height district. Q1: You’re bringing us into the area of what happened post-designation, which I want to ask you about. Both pre- and post-designation, I know work was done around the issue of design, design controls, and what new development should or shouldn’t look like. Of course, you had some of the first cases of development under Landmarks Law going through. Can you just talk a little bit about what you did in anticipation of that? Then also, when the particular cases come up, what you did to try to ensure that the new development really fit with what you were trying to achieve. Pearsall: Well, before designation—while we were being held up by the real estate interests in New York, who were opposing the Landmarks Law—the Landmarks Law was ready to go. I have in my file a complete draft, which is virtually a final thing. It was in January 1963, but the thing was not signed until April of ’65. There was a big long delay, and during that period we didn’t want to see a whole lot of damage done. We set up something called the “Design Advisory Council.” It was a group of architects in the community who volunteered their time when they heard that there was a building contract, or somebody was going to do an alteration or a renovation. They offered to provide advice and a lot of damage was avoided by the good works of that group. Q1: People voluntarily bought into this. Pearsall: Yes. Yes. It was a voluntary kind of thing. There was a lot of good will in Brooklyn Heights at that time. Everybody was kind of coming together, that this was a good thing to do. After designation, the first new building in any historic district—there was only one historic district—was Ulrich [J.] Franzen Watchtower building, at the corner of Pineapple and Columbia Heights. The Watchtower people thought they wanted a building. They had this building in mind. Q1: Had it been an empty lot, or what was there? Pearsall: The Norwegian Club, which was a Greek Revival building that had been totally stripped. It was a totally nondescript, non-contributing building. It was an old building, but just covered in stucco, there weren’t any features left. Quite apart from the big battle of a limited-height district and all that kind of thing which led to compromises with respect to this particular building, they were allowed to take down the Norwegian Club and build a new building. Of course, what was it going to look like? So the Watchtower people said, “We would like to have something historic.” They produced all kinds of pastiches of past carriage houses and things. It was the most awful thing. Then they came up with a proposal that—for a Greek-revival building that was going to be seven or eight or nine stories high and had a Greek revival—that was incredible. So the long and the short of it is that [L.] Bancel LaFarge, who had been very active in the Municipal Art Society, and was a member of the Landmarks Commission, one of the first commissioners, was sort of designated by [Geoffrey] Platt to be our guide on this issue. He was terrific. He waved his big stick from the background, but allowed us to be the bad guys. He put the Watchtower in a position where they had to accept one of our proposals. We came up with a list of ten architects, presented it to them, and they selected Ulrich Franzen. Ulrich Franzen built this first building, which was a contemporary building. Right from the very beginning, our view was that the right thing to do in a historic district was to build, at any moment in time, a building which was the best possible building representing the character of architecture at that time. Whatever it might be. Interestingly, Harmon [H.] Goldstone later wrote a book about all of us, called History Preserved [A Guide to New York City Landmarks and Historic Districts], about the first few years of landmarking. Around 1974 that book was published, and he has a whole write-up of the struggle. He has a very moving section in there about how the right thing to do was to build—not stage sets or replicas of previous eras, but—so we were influenced. Just before the historic district was designated, a group of buildings by Joe [Joseph] Merz had gone up on Willow Place. They received a lot of awards. They were contemporary, the scale was right, they fit in and everybody loved them. We had no doubt that the right thing to do was to do a contemporary building. Ulrich Franzen did that, and Goldstone memorialized that as the appropriate philosophy for the Landmarks Commission. But they lost their way over time. They got confused. I did a study a few years ago—Laura, you’ll probably remember—of the new buildings, post-designation, in Brooklyn Heights, of which there were about eighteen. It’s split right down the middle. Half of them are replicas, and half of them are contemporary efforts. Some more successful than others. Q1: This whole idea, though, of doing it in a contemporary style, but having it relate to the cityscape around it, seems like it was probably pretty new at the time. There was modern architecture, and there was sort of faux-historical architecture. This was kind of neither but hopefully the best of all. How did that concept come into what you were doing there? Pearsall: Well, you will remember that the group that got this whole thing going was largely architects. There were a bunch of lawyers and bankers, but there were a lot of architects, and they were all trained as contemporary architects. In fact, at that time, young, graduating architects weren’t even given historic preservation courses. That’s a completely new thing. They didn’t have any training in anything other than—so all of our conversation was always in terms of contemporary solutions. That would never have occurred to us, really, to do a replica. Later, people began wondering whether we shouldn’t be doing a lot of replicas. But we were pretty well persuaded that the right thing to do was the best possible architecture representing whatever ethic the building was built on. Q2: I want to ask you one more follow-up, and then I think we should open it up, unless you have a burning question. In terms of the Watchtower, I’m curious that you did a lot of education with them about that new building, and, I’m sure, had other conversations as well. As the major opponent to the district, what kind of neighbor are they today? Has that had an effect over time? That they are more sensitive to those issues? Pearsall: Well, there hasn’t really been any occasion to test that, because we are a regulated district, and they have not attempted to build anything within the district since the designation. The closest was just outside of the district. They proposed, oh, back in the early ’80s, maybe, they proposed a twenty-story building on the bluff, just outside the district. That was another occasion when the Board of Estimate was crucial to listening and to feedback. We did the feedback. Basically, they bought a lot of brownstones. They haven’t defaced any of them, as far as I know. They’ve been pretty good stewards of the buildings they own in Brooklyn Heights. But we have had occasion to build a new building in Brooklyn Heights—not as much as Watchtower. We’ve built several new buildings, but not as much as the Watchtower Society. Q2: So let’s open it up to questions, for either Otis or Andrew. Anybody? Lisa Ackerman: I have a question for Otis, given the things that happened later on in Brooklyn Heights. Were any of the institutions within the Heights part of the dialogue, or were they just not even brought into it. I was thinking of the Packer Collegiate Institute, and the Church of St. Ann & the Holy Trinity. The St. Ann’s School, I think, was still part of the church at the time. Since it’s a district, but also in addition to a residential neighborhood had buildings that later became individual landmarks, and later were involved in some contentious issues. I wondered if they were supportive, or just not part of the dialogue. And the Brooklyn Historical Society. Pearsall: Well, Brooklyn Historical Society was the Long Island Historical Society at that time, and it was very supportive. It was very much involved, and the senior people at the Historical Society were all involved in our committee and our effort. Anthony C. Wood: From a historical perspective, I think I was at the hearing literally forty years ago this December 3rd, when the City Planning Commission held a hearing on Landmarks Law. I believe at that hearing, [James G.] Vanderpool or one of the senior staff members of the commission, the mayoral commission at the time, was asked how many historic districts he imagined there might ever be. I believe the number was under ten, and today we’re over seventy. I’m just curious as one who was involved in those early, formative, discussions about the concept of historic districts, seeing how the idea has evolved and become so robust, how do you in your mind see the initial idea and how it’s grown today? How do you react to that as someone who’s seen that evolution? Pearsall: Well, I react very positively. I shared—you know, Vanderpool thought there might be three or four or something like that, and that’s how we were all thinking. It was the thinking under Platt, it was the thinking under Goldstone. It was really Beverly Moss Spatt who should get the credit for recognizing that the city did not have a mechanism for preserving neighborhoods, except this one. She spotted that, and went vigorously after it. Once the cat was out of the bag, everybody jumped on a landmine—to mix my metaphors any possible way. The fact is that at the beginning it moved very slowly. People did not have that expansionist view. Once everybody could see that they could get in on it and it worked, everybody wanted to get in on it. As far as I can tell, the process is still going on. In fact, I’m about to propose another historic district. I won’t tell you what. Audience Member: I have a question. I wonder, particularly in a city where real estate developers are king and many of our local politicians work with the real estate developers—if property in the neighborhoods have cultural significance but are deemed architecturally important, or aren’t landmarked, and how do you advocate or reinforce the idea that these neighborhoods need to adhere to certain design standards, and should be preserved? Q1: Laura’s the one who should answer this. Q2: Also, it has some relevance to the Gansevoort arguments that were made. Let me make sure that I understand. You’re talking about the public, but also educating our commission, is that right? Well, those efforts are underway. There have been a lot of people working on that issue for the past ten years, at least. Baby steps. I don’t know how many of you went to the Pratt [Institute] session last week, where a group from Denver came to talk about a cultural district there. There are two sitting commissioners in Denver now but had been consultants at the time, so they understood the mindset of the commission. So they were able to suggest a kind of approach that involved having a series of anchor buildings in the district that received certain, higher levels of regulatory protection than other buildings. They went and spoke to the commission here. What we hear is that it was a very good conversation. It was an opportunity for our commission to look at another city and start to think about these issues. Not a lot of headway has been made on that. Then, I think, on a local level, public education, again, has to be celebratory of a history that’s there, to get people interested, and to begin to understand how a built environment can represent a kind of history—and therefore, that built environment is worth a certain kind of care and stewardship. There are people doing that around the city, but it hasn’t developed the same kind of momentum of consensus that architectural significance has. One thing I’d like for you to talk about, maybe, is, is that struggle within the Gansevoort [Market] Historic District designation trying to make the cultural argument and the historical argument but being continually being pushed back into the architectural box by the commission, and what that was like. Q1: Well, for those of you who don’t know, the Gansevoort Market Historic District, which was designated in late 2003, which was the city’s 82nd historic district, basically covers a big chunk of what is commonly referred to as the Meatpacking District in Greenwich Village’s northwestern corner. It was certainly seen as a somewhat unconventional or unusual proposed historic district because, certainly, on its face, it’s not generally what you think of when you think of a historic district. It’s certainly not as pretty. It doesn’t have the architectural pedigree that most historic districts do have. There were a lot of hurdles to get over there. I think Laura accurately identifies what some of the tensions were in that battle, in that in order to, I think, make a credible argument and bring some of the people to the campaign who wouldn’t naturally be drawn to it, we had to speak to the fact that there were cultural properties there that were key to what we were trying to preserve. Yet, because the framework or the system that we had to try to approach to get what we were looking for, which was landmark designation, is one that isn’t so great about addressing those qualities and is more focused on architectural qualities. It was a little bit of a dance that we had to do, and sort of a little bit of a fine line. I think, ultimately, the way it was resolved, for better or for worse, was to make the argument that there were physical properties there that were worthy of preservation and regulation, even if they weren’t necessarily about high architecture by great architects. That probably a little more and a little different kind of leeway would be allowed in terms of what the commission would allow to happen there, in terms of changes, with an eye toward keeping an overall sense of character for the district. There was a higher percentage of buildings that they put in there that they considered no-style. I think there are more cases where they are willing to consider additions and alterations to existing buildings than probably in most historic districts. I don’t know that I would say that that is the perfect result, but I think it was probably the best result we were going to get under the current system. Q1: Can I just quickly add one thing? You know, the city used to have a mechanism called “Special Districts,” which they used to be more active about creating and enforcing. Now they seem to pretty much not create them at all, and sometimes they don’t even enforce them. I think that was probably the closest the city came to this sort of different kind of mechanism, where it’s not quite landmarking, it’s not saying these buildings should be preserved as is, but sort of putting in place these more specifically-developed, regulatory characteristics that are saying this area has a particular character and change can happen, but we want to make sure it happens in a certain way. I personally wish they would take a look at that again, or something like that. I think there should be something in between just standard zoning and landmark districts. There are a lot of areas that maybe aren’t the perfect fit for what one traditionally thinks of as a historic district, but certainly have very important characteristics, whether it’s their built form or their cultural history that deserves to be addressed, regulated and preserved. Audience Member: What did you call them? Audience Member: They’re in the zoning resolution. Pearsall: Andrew, do you know why the City Planning Commission is not in favor of these things? Q1: My sense is—my understanding is that they found them to be too cumbersome and too difficult for owners, in terms of the sort of regulatory hoops they would have to jump through. It seems as though the baby is sort of being thrown out with the bath water. They’re incredibly varied. Some of them are about what kinds of materials can be used. Others, like the neighborhood I live in in Hell’s Kitchen, it’s about special provisions ensuring that tenants aren’t harassed out of their apartments. It can be anything, and it can be tailored whatever way they want. They just seem not to be inclined to try anymore. Q1: So there was no balking, that this would be an infringement on their rights? Pearsall: Not at all. They were all very keen about the whole thing. We must have lived in a dream world [laughter]. Pearsall: Nobody knew what was coming. Audience Member: I have a question—since both the Greenwich Village representatives are here, and the Brooklyn Heights reps are here—what happened post-designation, and did your educational abilities get translated? Did they get tapped into by the people who were living in Greenwich Village, in the second district? Pearsall: Yes, Ruth Wittenberg. We had lots of conversations with Ruth Wittenberg, as we were going along. I know that she was listening attentively to everything we were doing, and was trying to benefit from it. Margot Gayle was working on the Jefferson Market Courthouse at the same time we were trying to pull together the Brooklyn Heights Historic District. I think she probably got started on that around ’59, ’60, ’61, somewhere in there, so there was some overlapping. We had some dealings with Margot, but there really wasn’t any institutionalized interaction. Georgia Delano: May I say, as a former Brooklyn Heights resident, that you did just a sensational job. Pearsall: Oh, you’re a dear creature. Georgia Delano: It was rather extraordinary. My husband and I, coming from just finishing Yale Law University said friends there said, “If you have to live in New York City, the only place to live is in Brooklyn Heights.” I brought along today something written by somebody who was kind of a grandfather to Brooklyn Heights—[B.] Meredith Langstaff. Audience Member: ’37. He said, “However, there is no need to despair. Our future is in our own hands. Do your bit on the block in which you live. Populate your block with neighbors you would like to have—from Flatbush, East Orange, Philadelphia, Cleveland, Manassas, Kansas City, Spokane or London. That is what was done before, we shall do it again. If Sutton Place can be redeemed from the madhouse around it, what can be done with Brooklyn Heights, from the foot of Fulton Street to Atlantic Avenue. We do not have to start with a slum, and we have many advantages. Work individually, join the Brooklyn Heights Association, and see to it that your association is an alive, forward-marching organization.” This man organized us into sweeping the streets. They were pretty dirty when we got there in 1943. Pearsall: It was a terrific course. Georgia Delano: We went out every Saturday and cleaned the streets. We had a rooming house next door to us, and we put out window boxes. The plants were all torn away, so what we did was we bought window boxes for the house next door and helped the children to plant them. We became sort of interwoven. In fact, my husband went to give a blood transfusion for a father, because they couldn’t find anybody who had the right blood type, and Billy happened to have the right blood type. They kept him in there. That kind of thing happened. There was just an extraordinary feeling that this was a community that was worth building and preserving. But you were the one who what made it. Pearsall: It was an idea whose idea had come, and all you needed to do was drop that idea into this really great place—Brooklyn Heights—and people were just naturally supportive. Georgia Delano: The interesting thing is that we moved to Washington, because my husband became the general counsel for the Peace Corps, and we moved into the historic district there, in Georgetown. When we moved back, we looked around, and in that very difficult time in New York City—we all remember what 1970 was like here, in terms of St. Mark’s [Place]. People just slept all the time, and there were drugs on the street. I saw Stephen Facey working with young people, in the churchyard here, rebuilding the churchyard. I said to myself, “Well, if we’re going to move back to New York City, we’d better live someplace hopeful.” Little did I know that we were moving back to a place—we bought a house on Tenth Street—that this was the very first historic district in Manhattan. That there was this firebrand here, a woman, who made it her life’s work to get that designation. Then she continued, when she moved away and was very elderly, she always continued to send in contributions to Landmarks Fund [ph]. Audience Member: I just had one question about the local residents, before. You said you were kind of living in a dream world, that you got all those residents of Brooklyn Heights behind it. Do you think you were kind of cashing in on the novelty of it being the first historic district? That’s one. The second part is to both of you guys. How different do you think it is? Like, then, dealing with ignorance of historic issues, and now like ignorance and misinformation—having to work your way through it. Pearsall: Andrew, why don’t you answer that? Q1: Well, you know, certainly, today, we’re still frequently up against a lot of ignorance and misinformation. When you get reactions from people about potentially landmarking their property, there’s a lot of fear. There’s a lot of inaccurate perception about what it involves. Sometimes people don’t want to be confused with the facts. It doesn’t matter how many times you tell them what it really means and really works, they’re not interested. Other times, there is a level of misinformation that you can overcome. Certainly, sometimes, you can connect them to people who have properties that are already designated, and they can share with them what the experience actually is like. Some of the realities are that it doesn’t mean you need to get permission to pull down your shades or change the curtains in your windows. Also the fact that it’s not necessarily an economic burden, which a lot of people fear. In fact, property values in historic districts tend to go up even more quickly than they do in surrounding areas that are similar but not designated. It’s just a different way, I guess, of profiting. So yes, I would say even today there is definitely an element of misinformation and it’s symbolic. Pearsall: I think I can say that we did benefit from the fact that nobody knew what all was really involved, except to the extent that we sort of imagined what might be involved. But the Brooklyn Heights press was enormously helpful, because it ran editorial after editorial about how, if we could only achieve historic-district status, the stability of the Heights as an attractive place to live would be guaranteed forever. That’s basically the message that they had, that was put out by the Heights press—which in those days ran to every corner of the Heights. They were right. Brooklyn Heights was only just coming out of a period of deterioration. The days in which the community felt threatened by deterioration were not that far behind, so the idea that this was something that would be stabilizing and would prevent a renewal of the downward spiral, was very positive and received in a very positive light by the people in Brooklyn Heights. We benefited from a variety of things like that. Pearsall: Most of the churches were involved one way or another. We would hold meetings—this whole thing got started, literally, in the undercroft of the [First] Unitarian [Congregational Society] Church on Pierrepont Street. We had a wonderful minister at the time, and he was always ready for a new idea, and always very supportive of young people with new ideas. We had all of our meetings in his undercroft. A pivotal meeting in the fall of 1965—pardon me, ’64—just before the Landmarks Law. Let’s see, when was it? I guess it was the fall of ’65. It was October of ’65. Platt came over. I think he wanted to see for himself—we were his pipeline as to what was going on in Brooklyn Heights. We assured him that everybody was keen about this thing. I think he really wanted to find out for himself, and he came over and we had a big meeting in the Plymouth Church. A big turnout, a wonderful Lancaster slideshow, great support for the historic district—and Platt went away satisfied. Some of the churches were more actively involved than others, but everybody knew about it and they were all supportive. Q1: Well, how did things change, and how did your work end up becoming a part of the effort to get a Landmarks Commission, which eventually led to Brooklyn Heights being the first district designated? How did that transition happen, and—I’m guessing, but I imagine these were sort of parallel tracks. What you were pushing for probably came together with a sort of broader effort to have a Landmarks Law citywide, and then you were the first beneficiary. Pearsall: Well, yes. We started that effort in February of ’59. We wrote a letter to the Municipal Art Society, to a fellow by the name of George Hopper Fitch, who was then president of the Municipal Art Society, telling him what we were trying to do. He responded with alacrity. He immediately set up a little sub-committee of the Committee on Historic Architecture of the Municipal Art Society, to help us out, to give us advice, and to be sort of a fatherly influence. That was Henry Hope Reed, Alan Burnham, and Albert Bard. Albert Bard, I think, was ninety-two at that point, and he and Alan Burnham, and we were hosted by Mrs. Darwin [R.] James, who was the grand dame of Brooklyn Heights, and had this marvelous apartment overlooking the river. We got together at her incredible apartment, and talked about this. We were really just kids at that point. It’s hard to picture me as a kid, but I had just started practicing law and I didn’t know anything. It was terrific to have these guys, who knew things, coming over and saying, “Gee, this is absolutely the right thing to do. It is exactly what the Bard Law,” which he had written, was intended to promote. So with that sort of backing, we were moving ahead but an awful lot of water went over the dam. We were focusing on historic districts, and the Municipal Art Society, through its Committee on Historic Architecture, was focusing solely on individual landmarks. That was their orientation. Q1: Which, to this day is a sort of tension in terms of strategies. Do you offer individual ad marketing? Do you offer district? It’s interesting to hear that right from the beginning, that was always a question. Pearsall: Well, it definitely was, but we got started with the things we needed to do. We needed to build our case, and when Clay Lancaster agreed to do the survey that led to the book, that was a major step forward. We had to mobilize our community. We went around the community, talking up our new ideas. We carried huge maps that showed everything by village and by style and age. There was a lot of preparatory stuff going on. Q1: Can I ask you this? In that vein, I know, historically, for Greenwich Village, it took until ’69. Part of what the struggle was and what took so long was that the city was pushing a series of smaller districts, some of which ended up happening, although eventually there was this one, fairly large district which included not everything that everybody wanted, but a big chunk of it. They were definitely trying to push toward a series of smaller, little islands and districts. What was your experience like in terms of the issue of what to include and what not to include? Was it always this clear idea—one big district that included everything that you got? Either internally or externally, were there forces pushing for something different, smaller? How did that work? Pearsall: We basically had one big district in mind, but it was an evolutionary process. The initial district we had in mind carved out various areas where we thought we might run into serious, blown-up, real estate opposition that we might have difficulty dealing with to carve those things out. Recently we’ve had some ramifications of that, because our idea was that we circle back and eventually circle these things in. But we recently lost a wonderful 1857 building, which is the Library of St. Francis College. It was very disappointing, because we had carved out the eastern perimeter of Brooklyn Heights, and we thought we would go back and deal with it—which we never did. Q1: That brought you closer to downtown Brooklyn and the more commercial areas. Pearsall: Yes. It was the big, tall buildings along Court Street and on the side streets that lead to Court Street. There were various other omissions that we made, and it became clear to the community that we were proposing to delete this or not include that. There was a tremendous—I won’t say uproar—but a lot of protest. “We want to be included.” The whole of Brooklyn Heights wanted to be part of this thing. So we ended up including, essentially, really, everything from Atlantic Avenue, all the way to the northernmost block in Brooklyn Heights. The only thing that really got excluded was that edge along Court Street, and that was sort of where the struggle went, in terms of boundaries. It wasn’t really a struggle. There wasn’t anybody to struggle with, as it turned out. Platt, who was the first chair, closed up the last couple of loopholes. We were going to leave the St. George out, he said, “Put it in.” We were going to leave out the northernmost block of Brooklyn Heights, which was clearly slated for redevelopment, and he said, “Put it in.” Whatever’s going to happen there, we want to have a regulatory ability to influence what—a little bit of a different attitude than some of the attitudes that I’ve heard about more recently. But he wanted to be inclusive, so they would be in a position to regulate. You asked how we got together with the Municipal Art Society, in the end—and we got together very early—but we really forged a strong alliance starting, I would say, in the fall of, I guess, ’61. What had happened was that Felt was the mayor’s guide on this. He was the chairman of the City Planning Commission, James Felt. He was not reacting warmly to the idea of historic rezoning until, actually—I’ve learned a little bit by reading this book that was written about the history of the Municipal Art Society, and it has some very interesting, additional information about what was going on, that I didn’t even know about at the time. Apparently, Felt gave a speech to the annual meeting of the Municipal Art Society in May of ’61, basically encouraging the idea—it was a complete reversal of form—encouraging the idea. He’d now gotten safely past the zoning ordinance. He’d gotten that enacted, and he encouraged the idea of historic zoning. That led to Platt and Goldstone meting with him, and they said, “Okay. You need to have a committee to look into this.” So Felt got the mayor in the summer of 1961. Everyone seems to think that this all began in a citywide basis with Penn Station [Pennsylvania Station], which is completely wrong. The mayor appointed a Committee for the Preservation of Structures of Historic and Aesthetic Importance, the summer of ’61. The Penn Station thing didn’t happen until April of ’62. Q1: Could you feel, though, that Penn Station kind of pushed things along farther? Pearsall: Oh, Penn Station was pivotal. Because, you know, here was the Municipal Art Society, which was sort of a small—there were some influential people who were members of it, but it was a small, somewhat elitist, broad group. Then there were a bunch of kids over in Brooklyn Heights who were making a big rumpus, etcetera, but who were they, and how did they know anything? Then, when Penn Station was threatened, and began receiving significant headlines, all the architects got excited about that. The mayor was then persuaded to actually establish a provisional Landmarks Preservation Commission, so denominated. That committee that had been set up the previous summer was converted into a commission. There was a little bit of a change in personnel, but basically it was the same thing. Platt was the chair, James Grote Van Derpool was hired to be the executive director, and he went right to work. It was in that context, in the summer of ’61, when we were trying to be independent. As I mentioned earlier, we were going to have an independent Brooklyn Heights historic district that we met with Felt and he, basically, was very sympathetic. He said, “Look, you’re going to have to go deal with Platt and the committee.” He kept struggling with that issue. We proposed, publicly, with a whole lot of fanfare, in the spring of ’62, in a stand-alone district, but it was never to be. The Penn Station thing created a spotlight on a citywide issue, and from that point forward it was clear that we should fold in with the Municipal Art Society, put up a united front, and go after a Landmarks Law. That’s what we did. Q1: I know that there were several things that you did, or that were part of this effort, that probably had a big impact on your eventual success. I wonder if you can just give us a sense of how important they were, and sort of what role they were. I know there were obviously a lot of property owners who were very much a part of this effort, who were in support. You mentioned, earlier, Clay Lancaster, getting him to do the book and being on board. How much did factors like these, as your effort moved along—how much did you see them helping and pushing it forward? Was it being able to say, “Here are actual property owners who want this regulation?” How much of it was having the imprimatur of a noted architectural historian, and the attention surrounding a book? How much of it was the research that was put together, to sort of document the clear history of this area? How did those work for you? Pearsall: All right. Well, Clay was a whole engine. He was a slight, ascetic man who, by his appearance, would not have commanded a huge amount of following. He was a powerhouse, and he generated a slideshow which was thrown throughout the Heights, over and over again, to all the institutions. He wrote a series of articles. He became famous in our community, and converted us all into preservationists. We signed up, through petitions, something like two thousand signatures, which included something like a full fifty-percent of all the owners of houses in Brooklyn Heights. The Heights press was a major factor. They got on board from the very beginning, and issued editorial after editorial, and gave us a tremendous amount of coverage. We were getting a huge amount of coverage in the New York Times. Nobody else had done this, so we were kind of a focus of attention. Q1: Did they find you, or did you find them? How did the press work? Pearsall: I really don’t remember. One of the earliest things that happened was that, in April of ’59, we had a big, huge town meeting at the Bossert Hotel [Hotel Bossert]. Hundreds of people came. It was a tremendous success. That morning, the morning of that meeting, there was a very large article with a big headline, in the Times, about how Brooklyn was going to hold a meeting, and it was going to establish historic zoning. I don’t know how we got a hold of the Times, or if they got a hold of us, but after that, once we were in their cross-hairs, they kept coming back and we received a lot of it. So all these things came together. We went out into various parts of the Brooklyn Heights community, which is not a very big place, and we would have little coffee klatches. We’d get the surrounding property owners in, and I would explain what it was we were up to and why it was a good thing. Again, it was funny that we never had any—I don’t remember anyone who was not in favor of it. Almost just hearing about the idea was enough to endorse it. Q1: Even the businesses, or the more commercial properties, towards Court Street? They never gave you a problem? Pearsall: John Codman was the real estate guy, and he came down from Beacon Hill. He had set up the Beacon Hill thing. He came down to address the annual meeting of the Brooklyn Heights Association in May of ’61. In connection with that, we got all the real estate people in Brooklyn Heights together in one room. It was amazing. These were all competitors; they were all friends—sort of. But all the real estate brokers and real estate guys, and Codman delivered a little speech, about how this was really going to be an answer for that. It was going to turn a sleepy community into a hotbed of real estate activity, and they were all going to profit from it. They all went away all charged up. When we finally got to the hearing in ’65, there were only two opposed—the Watchtower and St. Francis. St. Francis only because it didn’t know what was happening. As soon as it was explained to them, they withdrew their opposition. There was no opposition. Q2: Can I ask a question? Can you talk a little bit about the Cadman Plaza split, in terms of the founders. It also raises an issue of a group who, while not necessarily opposing the district, had a very different agenda and set of concerns that were about having affordable housing for middle-class—but also, there was a preservation component of that, too, in terms of the character of that area, that was ultimately lost. Pearsall: Yes, that’s a good point. I neglected to mention that area earlier. What became the Cadman Plaza site was a charming—it was a highly deteriorated area, sort of under the shadow of the Fulton L [train], but it was filled with wonderful houses. Some twelve-foot wide, Greek Revival houses with circular staircases. There was a lot of charm. There was a group at the north end of the Heights who felt that the Cadman Plaza site, which had been designated as a Title I project, should be included in the historic district. 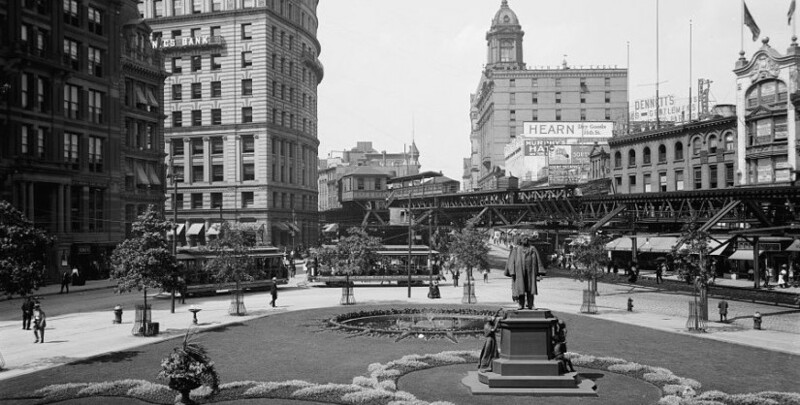 Part of that was that Walt Whitman’s Leaves of Grass had been published from a house on Fulton Street—at the corner, I think, of Pineapple and Fulton Street—and that was going to be coming down, as part of this Cadman Plaza project. So there was a strong desire on the part of a lot of people, including yours truly, to include the area. We didn’t, and the reason we didn’t was that we were going for the main thing. This has never been done before, not in New York, and we had no idea what we were going to be up against. We just made a cold-blooded decision that we were not willing to make it even harder to get this thing done by including Bob [Robert] Moses as an opponent. I’ve been second-guessed about that, over the years, and I’m of two minds. No one will ever know, if we had included Cadman Plaza, whether the whole thing would have gone down, or up, in flames. It was a tough decision and I took a lot of heat for it. I’m actually still taking some heat for it. People have long memories, unfortunately. The concern about public housing withered away, one way or another, and it was not at all a part of what we were involved in. It just never became an issue on the preservation side with us. The public housing idea had disappeared long before we got to 1965, and Platt decided to back off. Q2: Any other questions? Well, thank you, to Otis Pearsall, to Andrew Berman, and to all of you for coming. Come back for the rest of the series.